Seville’s coolest neighbourhoods have it all: great historical monuments, the city’s most charming streets and squares, colourful markets, tranquil parks and amazing tapas joints. Read on for our guide to the barrios to have on your itinerary when visiting the Andalusian capital. Surrounding the central plaza on which Seville’s mighty cathedral squats is the charming old Jewish neighbourhood of Santa Cruz, one of Andalusia’s most iconic barrios. This is the colourful, characterful centre of old Seville, and although it’s always packed with tourists, it hasn’t lost the small-town ambiance that has defined it for centuries. In this maze of narrow cobbled streets and achingly romantic squares are to be found some of the city’s best tapas bars and flamenco joints, but just to wander around Santa Cruz (and almost certainly getting lost, if it’s your first time) is an experience in itself. Particularly beautiful is Calle Agua (‘Water Street’), which runs along side the wall of the Alcazar, and the square it leads onto, Plaza Alfaro; on the latter can be found the building said to have inspired the balcony scene in Romeo and Juliet. 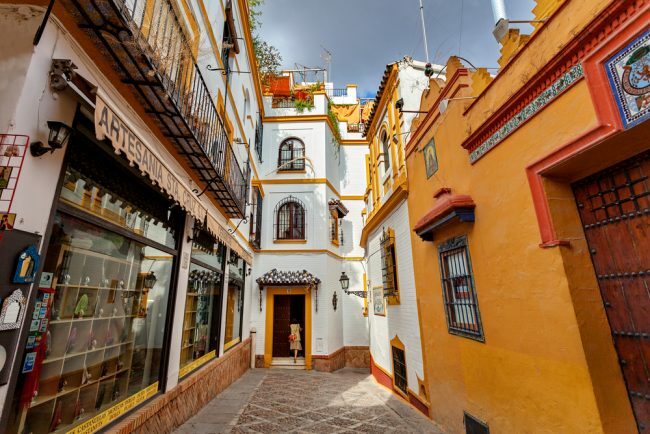 Alongside Santa Cruz, the Andalusian capital’s most famous barrio is Triana, the former Gypsy quarter that sits across the Guadalquivir river from the city’s main tourist attractions. From its pretty, myth-laden streets have come some of the most influential flamenco artists and bullfighters of the last couple of centuries – including the legendary Juan Belmonte, one of the greatest matadors in the history of bullfighting. Its deep association with these two Gypsy art forms is reflected in the wealth of old-style tapas bars, the walls of which are often plastered with old bullfighting posters and photos of flamenco artists (and the odd weeping Virgin Mary). It is also known for lovely handmade ceramics, which attractively adorn the walls of its old, whitewashed houses, and one of Seville’s best and most lively markets, the Mercado de Triana. 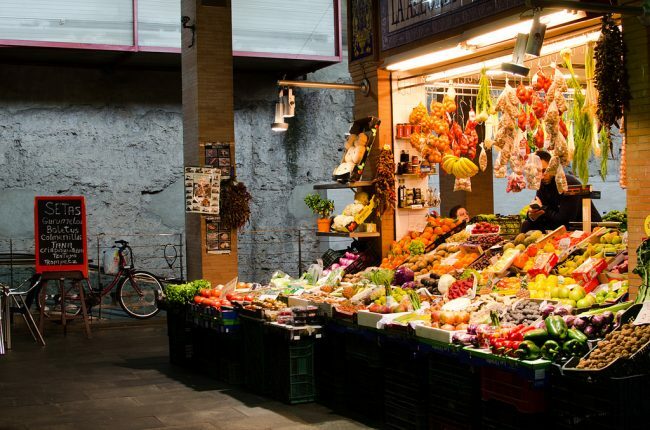 Built on the site of a medieval castle, this colourful cluster of fruit, veg and meat stalls is also a great place to stop for tapas and a cold beer. The network of streets surrounding Seville’s beautiful 18th-century bullring is known as Arenal. This is a smart, expensive residential district, evidenced by the well-dressed local crowd who populate its tapas bars and restaurants at lunchtimes and in the evenings. This barrio was once home to Seville’s great port, Europe’s most important gateway to the Americas after Columbus’s exploration of the New World in 1492. You can learn more about this crucial phase in Arenal’s history in the small but fascinating Naval Museum, located just across the river from the bullring in the Gold Tower (Torre del Oro). The bullring itself is this neighbourhood’s key attraction: along with Madrid’s Las Ventas, it is regarded as the most important in Spain and is the stage for some of the world’s best bullfights every spring. It is also one of the most strikingly beautiful structures in Seville and therefore a must-visit, even if you oppose the controversial spectacle that takes place within. Every April, the residential neighbourhood of Los Remedios – situated south of Triana on the west bank of the Guadalquivir –hosts one of southern Spain’s biggest parties, Seville’s annual Feria de April, or ‘April Fair’. This week-long celebration starts two weeks after the end of Holy Week, and each year a grand entrance is specially designed for the recinto, the sanded fairground on which the feria’s marquees are located. These marquees, or casetas, are the setting for seven days of unrelenting drinking, eating and dancing during the Feria de Abril, making this, for a week every spring, one of the busiest neighbourhoods in town. Even at other times of year, though, this barrio is a hive of activity and business. It was to Los Remedios that Seville’s port was relocated from Arenal in the 17th century. Its main thoroughfare is the grand Avenida de la Republica Argentina, which leads up to the river and, via Puente San Telmo, into the heart of historic Seville. A barrio whose name means ‘party’ couldn’t fail to make it onto a list of Seville’s coolest neighbourhoods. Comprised of several streets clustered around Calle Feria, the barrio’s central artery, this lively, attractive part of town stretches from north to south alongside the vast Alameda de Hércules, one of the city’s most popular nightspots, and brings you out in a bar-packed area of central Seville. 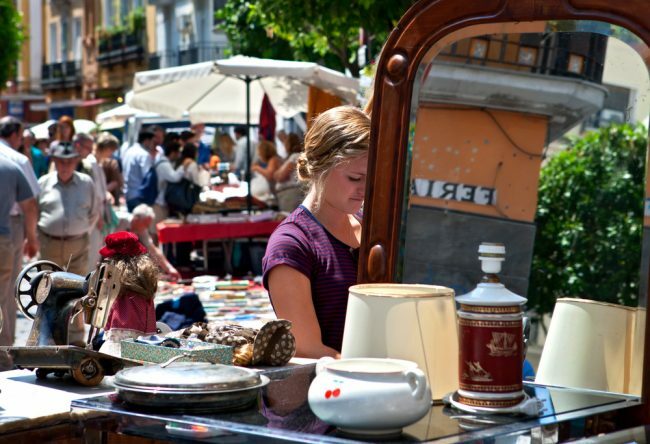 Feria’s principal street, the shabby Calle Feria, hosts Seville’s best flea market every Thursday, where you can buy all manner of treasures from its noisy, hectic vendors. Calle Feria is also home to Seville’s best vintage clothing boutiques – Ropero and Jueves (presumably named after the flea market) – whose presence lends this barrio an arty, grungy ambience that’s hard to find elsewhere in the buttoned-up Andalusian capital. Just north of the city centre is Macarena, a barrio notable for the largest remaining sections of the original Moorish city wall. Built by the Almohad dynasty, who ruled all of Islamic Spain between 1172 and 1212, this stunning monument stretches between two of the oldest entrances to the city, the Puerta de la Macarena on the west and the Puerta de Cordoba on the east. As well as being home to one of the oldest Moorish relics in Seville, Macarena is a now modern, commercially important part of town, with the Andalusian parliament operating out of what used to be the Hospital de las Cinco llagas (‘Hospital of the Five Holy Wounds’) and Seville’s oldest market, the Mercado de la Feria, situated towards the northern end of Calle Feria. It is also the starting point, every Easter, for one of the city’s best loved Semana Santa (Holy Week) processions, that of the Virgin of Macarena. Extending south of the historic city centre on the east bank of the Guadalquivir, the Distrito Sur, or South District, is home to central Seville’s prettiest park, the Parque Maria Luisa. Like the attractive Plaza de España that sits right next to it, this expanse of greenery, ponds and fountains was developed in the mid 1920s in preparation for Seville’s hosting of the Ibero-American Exposition of 1929. Indeed, the entire neighbourhood received a costly makeover for this prestigious fair and, happily, it has been superbly maintained ever since. Wandering amongst the South District’s leafy residential streets is a pleasure in itself, but you’ll also want to check out the beautiful Plaza de España, one of the city’s finest examples of neo-Mudéjar architecture, as well as the Museum of Popular Arts and Customs of Seville, located on Plaza America in the Maria Luisa Park.